National University of Singapore (NUS) Korean Cultural Interest Group Dance Team (KDT) will be holding their first solo showcase this February. #KDTthrowback, as implied, will be revolved around the theme of throwback, with the showcase segmenting into the different eras of K-Pop. It has been quite a while since the Hallyu wave swept across the globe, influencing many music and dance lovers. 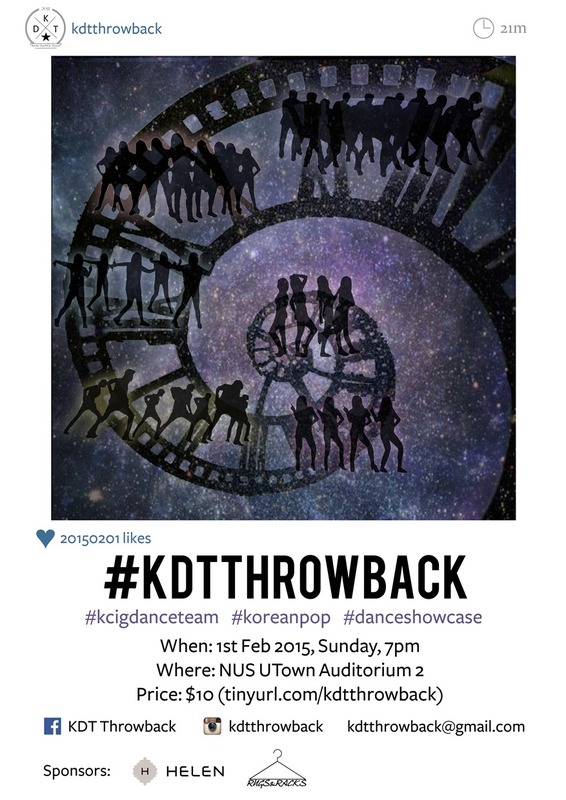 Hence, the concept for #KDTthrowback is to commemorate the Hallyu wave, by taking a walk down memory lane and reliving the remarkable diversity it has come to encompass, by performing songs ranging from the legends (BoA) to the current most popular groups (EXO, SNSD, Infinite, B1A4, Miss A). The KDT team will be recreating the dances while singing, and snippets of videos will also be showcased in a time travel series of events, in its set list of 30 songs. Tickets to #KDTthrowback is selling out fast with more than 80% of the tickets sold! So what are you waiting for? Do grab your tickets HERE if you have not done so! For more details regarding #KDTthrowback, do visit their Facebook page HERE! ← Catch the annual Seoul Music Awards live in Seoul!